If you're going to visit only one skyscraper in your life, it has to be Burj Khalifa. To date, this sculpture is the tallest building in the world, standing magnificently in the heart of Dubai. From far, you can see the luminous building reflecting the bright sun ray of the desert. You can see the sculpture everywhere you go. The nearer you get to it, the bigger it becomes, like God watching your every step. Surrounding the building is a large man-made pool and supported by a large foundation, which is the home of The Dubai Mall. At night, water fountain at the pool dancing to the rhythm and lights, creating a symphony to give praise to the tallest building in the world. Like most skyscraper, you are required to purchase ticket to access to the observation tower. Also, there is a headcount limit to ensure the deck is not overloaded. The observatory isn't the tallest point of the building, but it is the highest peak that opens for public access. For convenience, I would highly recommend buying your tickets online. You are able to guarantee your spot by choosing your preferred time. Tickets are also available to purchase at the counter, however your preferred time may be subjected to availability. I'm half as tall as Burj Khalifa..... the replica. While waiting for your entry at the lobby, feel free to educate yourself with all the information about other skyscrapers in the world. As a Malaysian, I feel proud to see KLCC standing at the hall of fame among the rest of the world. It somehow makes me feel homesick as well. Having the opportunity to stay in one of the richest country in the world (UAE), it didn't take the Malaysian out of me. Wherever I am, Malaysia is still the best in my eye. I can be standing at the tallest building in the world, staying at the most luxurious hotel, dining in a prestigious restaurant, but home is where the heart belongs. Upon entering the lift, visitors are bound to go through a time tunnel where a huge LED screen presenting the UAE's brief history - rising from a plain desert with nothing to offer, into a rich and booming country. At the top, I could see sand storm approaching. This reminds me of the climax scene in Mission Impossible: Ghost Protocol. Closer to the building, you can see the beautiful sea green pool that surrounding the building. I had a glimpse of imagination what life would be if I have the chance to own one unit of the apartment right next to the pool, overlooking the impressive Burj Khalifa. When at the top, my entire perspective changed 360 degrees. On ground, overlooking the gigantic iconic structure, I felt inferior. What seems to be God watching me, is now the totally opposite. I felt like God watching people minding their business from the top. It is pretty interesting to find how one's mindset can change to where they are standing. 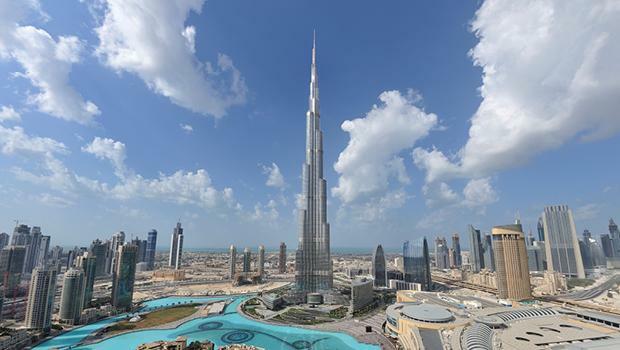 Allocate one day to discover Burj Khalifa, The Dubai Mall, water fountain and its surrounding. Online tickets can be printed at the kiosk. To save your time, you don't have to queue at the counter. Ticket cost about AED200 for adults, which is about RM232.